How close are we to summer?! I’m in a baby daze but the produce is looking really good at the market! Anyhow, I wanted to make a really fresh appetizer for a little get together but I really didn’t have time/patience to make anything elaborate with an aged balsamic or cheese cut into the perfect shape. With the twins on the way you can bet I’m looking for ALL the shortcuts! So I made these super simple and healthy (that’s a nice change of pace ?) 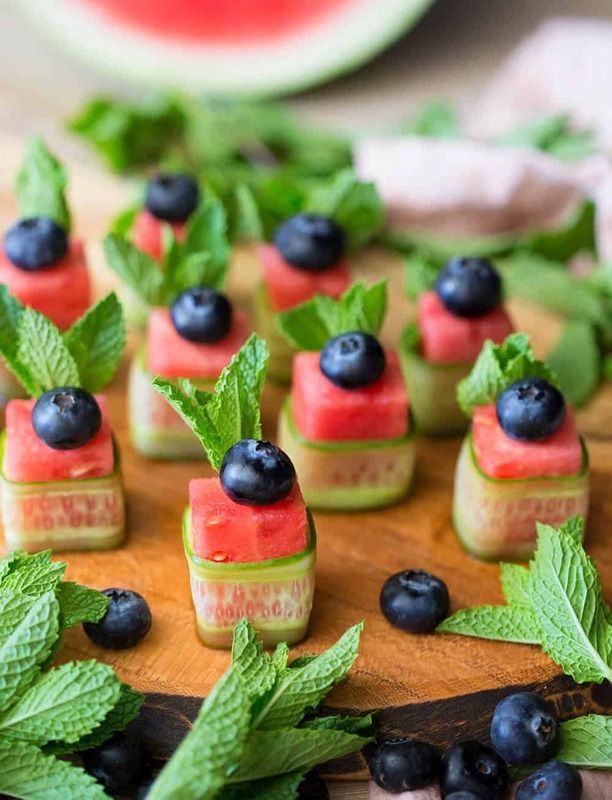 watermelon canapés; all I added was a sprig of mint, a paper thin slice of cucumber and a blueberry. Gravity and surface tension holds it all together and my gosh they were really good! You can pop them right into your mouth and feel guilt-free! ? Use a peeler to get thing slices of cucumber. 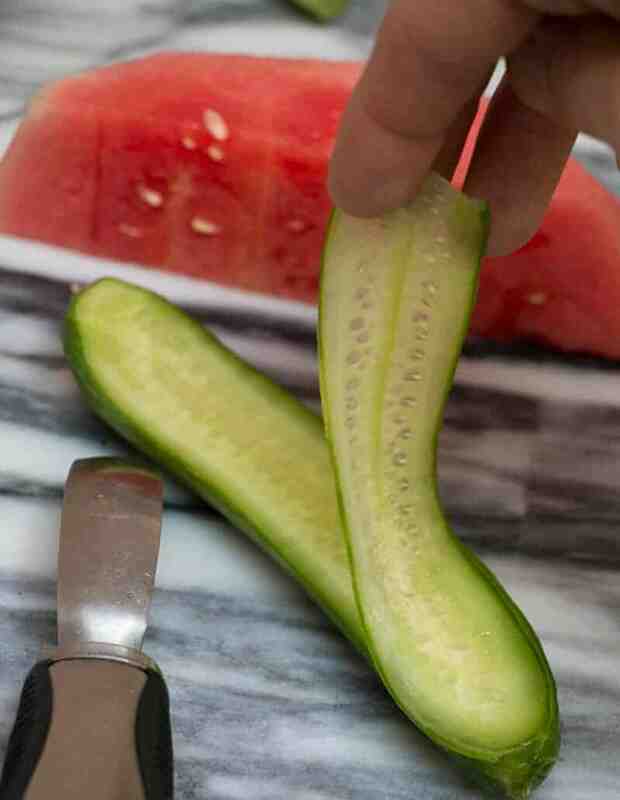 Trim the ends and wrap the cucumber around the watermelon. Place the sprig of mint. Top with a blueberry and you’re done! 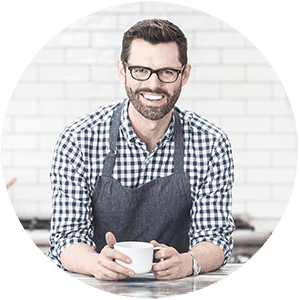 Hard to believe this can be so easy simple and healthy and delicious! 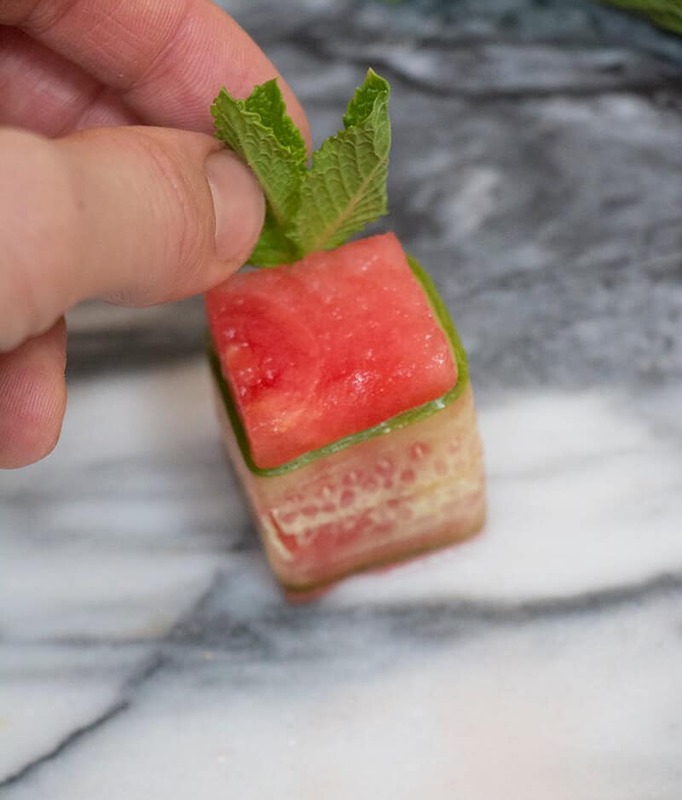 Cut the watermelon into cubes or rectangular prisms. Use a vegetable peeler to slice the cucumber. 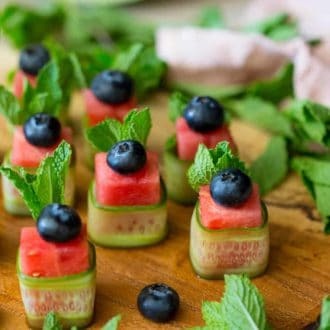 Wrap the cucumber around the watermelon cubes. 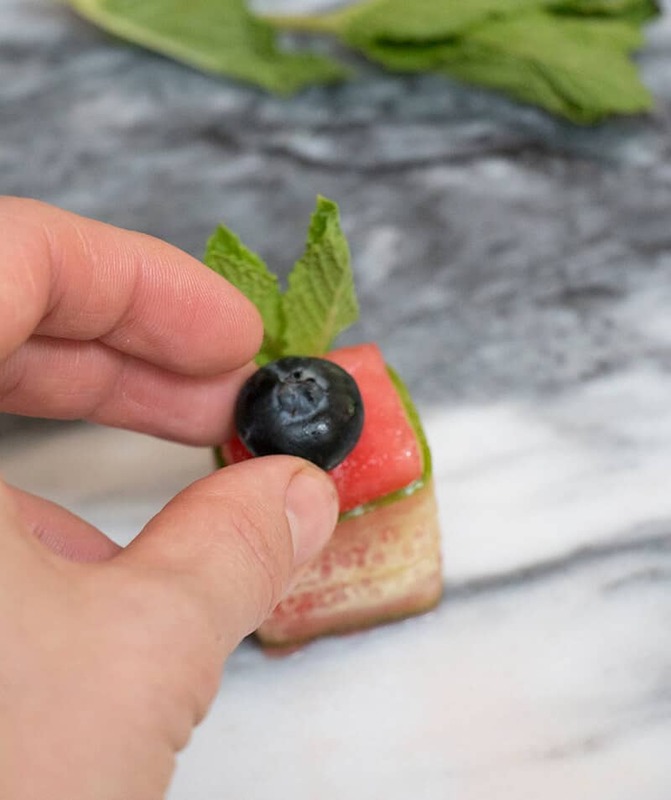 Add a sprig of mint between the watermelon and cucumber then top with a blueberry. These are unbelievable! Thank you. WOW!!!! EVERYONE LOVE THEM. ABSOLUTELY DELICIOUS!! These are so cute!! I am also loving all of the produce on the market right now. I want to buy it all! Thank you very much! Me too! Hope you enjoy! These are SO cute! And I love how refreshing they are – perfect for a hot summer day! 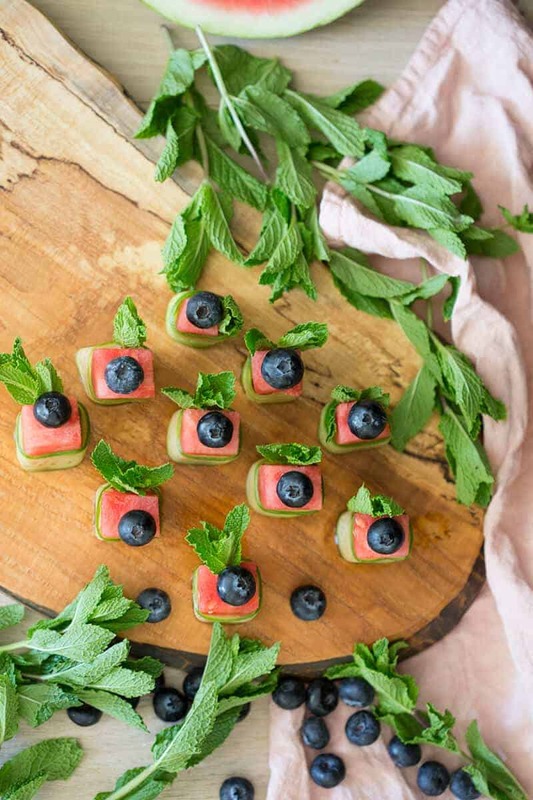 Totally making these for Memorial Day! !